Cocktail-themed chocolate bars blend your favorite indulgences in a delightful confection. Too long you've been enjoying your favorite nightcaps and chocolate separately. Not anymore, folks. Allow us to introduce these cocktail-themed chocolate bars generously spiked with boozy flavors. 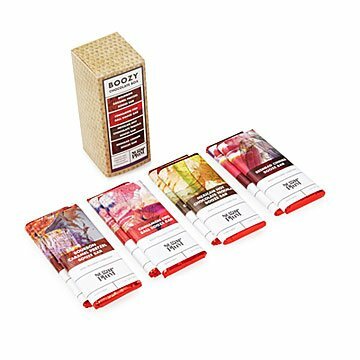 Nosh on four rich combinations (two bars each) including: Bourbon Caramel Pretzel, Cinnamon Fire Ball, Mexican Hot Chocolate Tequila, and Redhead Cinner. The best part: They're alcohol-free (though you'd never know it), so you don't have to wait til 5 o'clock to enjoy these delightful confections. Made in Pennsylvania. I gave this to my husband for Christmas. He considers himself a chocolate connoisseur, and did not like this chocolate at all. He tried a square of each of the bars and ended up throwing the whole box in the garbage. It was a real disappointment to him. We love chocolates and appreciate is booze! How did we use this product? We ate it. I got this as a father's day present and he loved them. He has not had a chance to eat them yet,(busy guy) but he was very happy to get them. And being made with that stuff made it more the better for him to munch on. I loved the packaging. The freezerpack and insulated box kept them from melting! We had a heat-wave and they survived the trip here in one piece. Nothing was melted or soft. It was hard as though I had bought it in person that very same day. I will HIGHLY recommend these for a father's day gift or a groom's gift! I cannot eat them due to health issues with my diet but they smell fantastic!!!!!!!!!!!!!! !